cupcakeMAG for Littles: Fashionable Treats for Chic Moms & Their Babes: stroller trend alert -- do you have the hottest new accessory? stroller trend alert -- do you have the hottest new accessory? The newly launched texthook is the ultimate smartphone holder and a must have accessory for 2010 - to help you stay in touch on the go. 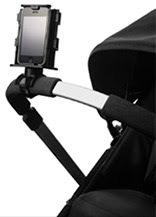 The very convenient holder for your iphone/blackberry is the hottest new accessory for your stroller and fits on all handlebars making it perfect for springtime strolls for parents & their little tots. It is great for that multi-tasking momma we all are and perfect for any gym enthusiast too as it also attaches to a treadmill and bike. We know you will be HOOKED! Sleek & stylish - it is a "must have" for all chic moms on the go and their active lifestyle. It is quickly to become a new fave item for urban parents with a affordable price tag of just $26. It is also available now on Amazon.